Arthur Umanoff 21 bottle wine rack for Shaver Howard. Butcher block top was sanded and waxed, leather straps were cleaned, treated with leather conditioner and are solid, may have a few wine stains to leather. Original black paint to frame, minor loss to paint. Arthur Umanoff for Shaver Howard 1950s iron and leather strap wine rack. Leather straps are solid, but may have a few old wine stains. Pair of Arthur Umanoff bar stools for Raymor with rush seat backs, slat wood seats and iron frames. Currently being refinished, seats will be refinished and frames repainted. Neat wrought iron wine rack designed by Arthur Umanoff for Shaver Howard/Raymor. Additional Umanoff wine racks in various sizes and styles also available. Combination of iron and leather wine display that holds 48 bottles. Arthur Umanoff wine rack, circa 1955. 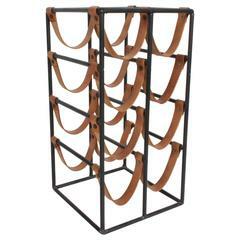 1950s Arthur Umanoff wine rack composed of painted wrought iron construction. Tabletop version, accommodating 7 bottles. The largest example of this style of wine rack we have had the pleasure to offer, holds up to 100 bottles. Exposed metal superstructure with interior wood elements to cradle the bottle.